Woodbridge, Connecticut - Tuesday, April 2, 2019: Amity H.S. girls lacrosse vs. North Haven H.S. Tuesday afternoon at Amity H.S. in Woodbridge. 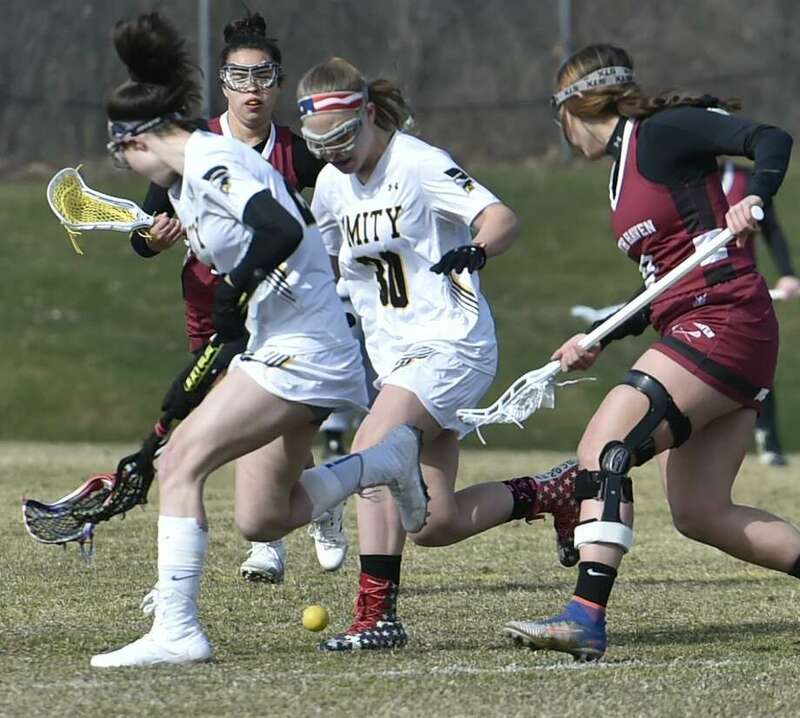 Annie Uyeki scored five goals and added an assist for the North Haven girls lacrosse team, which defeated Amity 11-10 Tuesday in a Southern Connecticut Conference game at Woodbridge. Meg Christoforo added three goals for the Indians (1-0). Ana Carney scored five goals for the Spartans (1-1). Scoring: Amity: Payton Grande 1, Elaina Ferraro 1, Jenna Walsh 2 Assists, Natalie Huber 1 Goal, 2 assists; Lauren Ronai 1 Goal, 2 assists, Ana Carney 5 goals, Payton Papa 1 goal. ; NH: Molly Scarpa 2 G, Callie Kessler 1 G, Madison Fredricks 1 A, Annie Uyeki 5 G, 1 A, Meg Christoforo 3 G; Shots: Amity 19, NH 18. Saves: Amity: Payton Rahn: 9; North Haven Casey Kross 6. Records: Amity 1-1, NH 1-0. Records: Immaculate 1-0, ND-Fairfield 0-2. Scoring: I—Madison Halas 5 goals, 1 assist, Kennedi Muller 3g, Rachel Iannarelli 3a, Emma Baughman 2g, Analiese Seaman 2g, Emma Halas 1g, 1a, Caroline Brown 1a, Giselle Rodriguez 1a; NDF—Jenna Sabia 1g. Goalies: I—Emily Mannion (2 saves); NDF—Janelle Rosales (14). Shots: I—31; NDF—7. Records: Barlow 0-1, Newtown 1-0. Scoring: B—Bella Miceli 1 goal, Julia Shapiro 1g, 1a, Julia Hartmann 1g, Eastus 1a; N—Rylee Harrell 2g, Sughrue 1g, Julia Gerace 1g. Goalies: B—Megan Florkowski (6 saves); N—Catie Gregory (4). Shots: B—12; N—13. Records: Masuk 1-1. Scoring: M—Maya Henry 5 goals, Melissa Psaras 2g, Jess Bennett 1g, Paige Jelliffe 1g; NM—Sarah Morris 3g, Erinn O’Hara 1g, Jillian Melendez 1g. Records: Bunnell 0-1, Pomperaug 1-0. Scoring: B—Mariana Trovarelli 1 goal, Morgan Reilly 1a; P—Kathleen Schenk 3g, Jillian Murray 3g, Camden Frissora 3g, Maddie McKhen 1g, 1a, Jessica Evans 1g, Cassie Reilly 1g, Maris Debenedetto 1g, Olivia Heckendolf 1a. Records: Brookfield 1-0, Stratford 0-2. Highlights: S—Edie Threshie scored four goals to lead the Red Devils. Scoring: L—Ashley Moynahan 4 goals, Hannah Kleinbeck 3g, Chloe Madzio 3g, Callie Cirilli 2g, Caroline Sullivan 2g, Paloma Meehan 1g; SJ—Jettke Gray 3g, Isabelle Casucci 1g, Kylie Lucifora 1g. Scoring: V – Allie Ruel 6 goals, 3 assits, Celia Ghilani 5g, 3a, Victoria Rider 3g, 3a, Emmy Bisson 1g, Salmi Miller 1g; M – Madeline Stopkoski 6g, 2a, Olivia McCray 2g, Lindsay Narracci 1 g, 2a, Erin Lindsay 1g, Carley Schmidt 1a. Goalies: V – Mia Cost (6 saves); M – Cassidy Shepard (7). Shots: V – 27, M – 19. Records: Valley 1-1, Morgan 0-1. Scoring: W—Jack McKenna 2 goals, 3 assists, Blake Epstein 3g, Charlie Digiacomo 2g, 1a, Zack Corsi 1g, 1a, Sam Palmer 1g, Jimmy Cullinan 1g, Devin Napol 1g, Ryan Janz 1g, RJ Ihlefeld 1g; SJ—Ryan Daly 2g, Declan McGinley 1g, 1a, Karl Kelly 1g, 1a, DaSilva 1g, Carpenter 1a, Coughlin 1a. Goalies: W—Chris Gonzalez (9 saves); SJ—Eric Burbank (6). Highlights: N—Michael Propersi scored the lone goal for the Bears. Jack Flanagan and Tom Swank combined for 11 goals for Hand in its season-opening, non-conference home win. Scoring: Records: Conard 0-1, Hand 1-0. Scoring: Conard — Mckintosh 2g, Carr 1g, 1a, Suarez 1g, Hindsin 1g, Mahon 1g Hand— Jack Flanagan 6g, Tom Swank 5g, 1a, Tom Ferrick 3a, Liam Regan 1a, Tripp Bordiere 4g, 2a, Shane Reiner 2g, conner Bergere 1g,1a, Ryan Flynn 1a; Goalies: Hand—Griffin Fitzmaurice (7 saves) Clay Hayden (4 saves). Shots: Conard 20 , Hand — 40. Scoring: Goals: OS: Jack Adams 3, Alem Tiden 3, Ian Mason 2, Will Peralta 2, Nolan Heiden 1, Ryan Slisz 1, Mitchell Dipalma 1. Assists: OS: Alem Tiden 2, Will Peralta 1, Matt Murphy 1. Shots: Old Saybrook 31; Vinal 6. Saves: (Old Saybrook)James Carlin 6; (Vinal) 14. Records: Old Saybrook 1-1; Vinal 0-2. Scoring: LM – Gavin Cabral 1g, Evan Batch 1a; S-Casey Brennan 3g, 1 a; Nick Pagliuso 3 g, 1 a; Nick Pavone 3a; Tyler Pjatak 1 g, 1 a; Jared Sedlock 1g, 1a; Jack Carr 1 g; Jake Oddo 1g, 1a; Connor Greent 1g; Jake Falanga 1g. Goalies: LM – Coeper Robinson (9 saves); S – Daschel Kline (6). Emily Gell pitched a complete game, three-hit shutout with 11 strikeouts as the Trumbull softball team improved to 3-0 with a 9-0 win over Barlow in a non-league game Tuesday afternoon. Mackenzie Bruggeman went 3-for-4, including a solo home run and a two-run double, and Jenna Duffy had three hits and three RBIs in the win for the Eagles. Abby Ota had two of the team’s three hits for the Falcons (1-1). Records: Trumbull 3-0, Barlow 1-1. Batteries: T—Emily Gell (W, 3-0) and Cassi Barbato; B—Claire McCann (L, 1-1) and Gabby Tuccinardi. The Brookfield softball team has picked off right where it left from 2018 as an offensive barrage has led to a 3-0 start. The Bobcats claimed their latest win Tuesday by holding off Greenwich in a 13-12 slugfest. Brookfield (3-0) has reached double-digits in all three wins. Against the Cardinals Kailee Synder, Avery Katz and Hanna Scallon all had three hits as the hosts survived a seven-run fourth inning by Greenwich. Batteries: G—Sophia Prieto and Olivia McClammy; B—Emma Sands, Jillian Mitchell (W) and Emily Parchinski. Highlights: G—Emma Beinstein went 4-for-5 with a double and two runs scored. Olivia McClammy went 3-for-5 with three runs scored. B—Kailee Synder went 3-for-4 with two doubles and four RBI. Avery Katz went 3-for-5 with a double and two RBI. Adrianna Fiori went 2-for-4 with a double, two RBI and two runs scored. Hanna Scallon went 3-for-4 with three runs scored. Records: Waterbury Career 0-2, Seymour 1-1. Batteries: WC—Verannie Fiquerido (L, 0-2) and Tabatha Palomba; S—Jenna Geffert (W, 1-0) and Kolby Sirowich. Highlights: WC—Fiquerido had two hits, including a two-run home run. S—Geffert struck out nine. Sirowich and Molly Adamo each had two hits. Highlights: HC—Hannah Brown had two hits. O—Molly Sastram had two hits, including a home run. Autumn Mitchell had two hits, including a triple. Sophie Gendron doubled. Records: St. Joseph 1-0, Sheehan 1-1. Batteries: SJ—Payton Doiron (W, 1-0) and Charlee Horton; S—Riley Wolchester (L) and Ryan Wolchester. Highlights: SJ—Doiron struck out 14 and went 3-for-4. Kaitlin Capobianco and Brittany Mairano each had three hits. S—Ry. Wolchester tripled and scored one run. Records: Derby 2-0, Crosby 0-1. Batteries: D—Alexis Enjem (W) and Madison Koval; C—Luz Matos (L) and Marissa White. Highlights: D—Cristina Carloni went 3-for-3 with one RBI, two walks and four runs scored. Riley Miller went 2-for-2 with three walks and three runs scored. Olivia Ruggiero went 3-for-4 with three RBIs and three runs scored. C—White hit a solo home run. Matos and Angelina Ovalles each singled. WP– Kaitlin Snyder. LP– G. Cordon; Notes: Cromwell catcher Monica Dewey hit a grand slam. Cromwell DP- Kayseigh McCaleb had three hits to lead the Panthers..
M: Heidi Gaudet and Alex Duval; HR: Hannah Lemke, Sam LaFemina (2) and Erin Molkenthin. Notes: HR: Skyler Rapuano 3-5, single, double, triple. 1 run scored. 4 RBIS. With a walk off triple with the bases loaded, 2 outs in the bottom of the 7th to win the game. Morgan: Bella Mongillo 2-4, double and triple, 4 RBIs, 1 run. WP: Ivy Santos. LP: A. Senchez. Notes: Santos went 3-for-3 with three RBIs and Rodriguez, Pinkett and McCarthy all had two RBIs for West Haven. Batteries: B—Jovanna LaSita, Kelly Tito and Christina DaSilva. Highlights: B—DaSilva had three hits, including 2 doubles and scored five s. Tito and Natasha Redmond had three hits. NOTE: Monday score. Records: Crosby 1-2, Derby 1-0. Batteries: C—Richard Caraballo (L, 0-1), Jonathan Maisonet (3), Erick Crespo (4), Alex Puente (4), Jayden Estrada (4) and Xavier Gonzalez; D—Bryce Cotter (W, 1-0) and Ty Netto. Highlights: C—Joshua Bolough went 2-for-3 with one run scored. Caraballo hit a RBI-sacrifice fly. D—Tom Abel reached base five times, going 3-for-3, including a double and a three-run home run, with three runs scored and four RBIs. Ray Queen went 3-for-3, including a double, with two RBIs. Cotter struck out eight. Highlights: B—I—CJ Johnson pitched five innings with six strikeouts. CJ Cianflone and Johnson both recorded two hits and Cianflone scored two runs. WP: Matt Lauria. LP: Conrad Derry. ; Notes: For Hale-Ray, John Linares went 3 for 3 with an RBI and scored twice. (At Branford): Singles: Joe Delgado (WH) def Praneeth Ganedi (B) 6-3, 3-6, 10-4; Eli Hanlon (B) Def Zac Kerzner (WH) 6-0, 6-2; Dan Mcguire (B) def Punavasan Garani (WH) 6-0, 6-1; Paul Riccio (B) def Anthony Siaphong (WH) 5-7, 6-3, 6-4. Doubles: Dan Pagliaro & Kurt Schalper (B) def Riyad Al-Bakeri & Nash Noble (WH) 6-3, 6-4; Jaden Andresen & Josh Berdon (B) def Jason Ramean & Lucien Zheng (WH) 6-1, 6-4; Wes Raymond & Jason Hackett (B) def Aawab Osman & Ron Wood (WH) 7-5, 6-2. (at East Haven): singles: Ryan Money (F) def. Dan Murtagh 6-0, 6-0; Nico Esposito (F) def. Marchello Delucia 6-1, 6-1; Connor Rowe (F) def. Matt Gaudioso 7-6 (7-4), 2-6, 6-3; Petie Mata (F) def. Mateausz Wiszniewski 6-4, 6-2; doubles: Joe Brown/Mat Divito (EH) def. Eric Levesque/Alex Mingrone 7-5, 6-4; Danny Abate/Jared O’Sullivan (F) def. Gabe Olszewski/Devon Lopez 6-3, 6-3; Matt Battaglino/Fabrizio Bugati (EH) def. Patrick Semana/Stephen Urquia 6-0, 6-0. Records: Foran 1-0, East Haven 0-2. (at New Haven): Singles: Sanskar Shah (JL) def Ida Brooks (WC) 6-2,6-2 ; Adarsh Sentilnathan (JL) def Thea Raneli 6-0,6-3; Jacob Martin (WC) def Brian Zirkel (JL) 6-4,6-2 ; Daniel Folloni (JL) def Molly Drew (WC) 6-3,6-1 . Doubles: Andrew Anchela and Marcello Silva (JL) def Charlie Cairo and Sonny Phouadura (WC) 6-4, 6-3; Angel Santiago and Lucas Greifzu (JL) def Fernando Morales and Jonathan Lapo (WC) 6-3, 6-3; Pardhip Nair and Julien Roy (JL) Nile Lee and Sophie Wilson (WC) 6-0,6-0. Records: Wilbur Cross 0-1; Jonathan Law 1-0. (at Guilford): Singles: Alex Kagan (G) def. Nash Lovallo 6-3 6-2. Gianni Esposito (G) def. Chris Hilton 6-4 6-1 Walker Mulligan (G) def. Louis Guzzi 6-2 6-2. Peter Haley (F) def. Erik Mastalerz 6-3 6-3 ; Doubles: Noah Horton/Dominik Dadak (G) def. Ethan Fabro/Kyle Hany 6-7 (4) 6-4 6-4; Zander Jehle/Max Fuller (F) def. Ethan D’Angelo/Ronan McDermott 6-4 2-6 6-0. Nick Antony/Ethan Corpuel (G) def. Jon Godin/Patrick Kelly 3-6 7-5 12-10. Records: Fairfield Prep 0-1; Guilford 2-0. (at Madison): Singles: Josh Israel (DH) def Alex Keagan (G) 6-3 6-2; Gianni Esposito (G) Def Noah Gulla ( DH) 4-6 1-6; Sebastain Lowy (DH) def. Walker Mulligan (G) 6 -2 7-6 (9-7); David Levchenko (DH) vs Erik Mastalerz (G) 6-3 6 -3; Doubles: Darby Rogers/Reilly Vejar (DH) def Noah Horton/Dominik Dadak (G) 6 -0 6 -0; Nick Chippeo/Will de Chabert (DH) Def Ethan D’Angelo/Ronan McDermott (G) 6-1 6-0; Jamie Watkins/John Van Ostenbridge (DH) def Ethan Corpvel/Nick Antony (G) 6 -3, 6 -1. Records: Hand 1-0; Guilford 1-1. (at Wallingford): Singles: Mark Amodio (S) v. Artur Munoz (C) 6-0, 6-1; Andrew Saball (S) v. Christian Morales 6-0, 6-0; Aymen Tayoubi-Idrissi (S) v. Ken Padilla (C) 6-0, 6-0; John Womelsford (S). Doubles: Gabe Wells/Julio Serna (s) v. Ivan Perez/Emma Oseu-Bonsu 6-0, 6-0; Noah Becker/Joh Yoder (S); Andrew Carboni/Mike Morales (S). Career forfeited 4 singles and 2 and 3 doubles. Records: Sheehan: 2-0; Career 0-1. (at West Haven): Singles: Joseph Delgado (WH) def. Christian Ripke (S), 6-1, 7-5 2. Zach Kerzner (WH) def Josh Hunter (S) 6-4,6-4 3. Adam Rossetti (S) def. Punarvasan Garani (WH) 6-1, 6-0 4. Hritish Bhargana (S) def Anthony Siaphong (WH) 6-3, 6-3. Doubles: 1. Riyad Al-Bakri & Nash Noble (WH) def Spencer Hatfield & Owen Corbett (S) 6-3, 6-4 2. Suhass Nadella and Archit Bhargana (S) def. Jason Ramirez and Lucien Zheng (WH) 6-1, 6-1 3. Awaab Osman and Ron Wood (WH) def Carsen Rhodes and Jeff Lin (S) 6-7, 6-1, 7-6. Records West Haven 1-0; Shelton 0-1. (At Wilbur Cross): Singles : Ida Brooks (WC) def. Arturo Muñoz (C) 6-1,7-5; Thea Ranelli (WC) def. Cristian Morales (C) 6-1, 6-2; Jacob Martin (WC) def. Julius Pugh (C) 6-0, 6-0; Molly Drew (WC) def. Alex Vazquez (C) 6-3, 6-1; Doubles: Charlie Cairo and Sonny Phouadura (WC) def. Ken Padilla and Ivan Perez (C) 2-6, 7-5, 10-7; Johnathan Lapo and Aldo Cortes (WC) def. Josh Smith and Eman Osei-Bonsu (C) 6-0, 6-1; No. 3 doubles forfeited by Career. Records – Cross 1-1; Career 0-2 . (at Middletown): Singles Brett Gloria (A) def. Matt Fuffo (X) 6-4, 6-3; Khai Ton (X) def. Chris Bullers (A) 6-4, 6-1; Eddie Basauri (X) def. Ira Einbinder (A) 7-6 (7-0), 6-2; Ben Schiff (A) def. Owen Ou (X) 6-2, 6-0. Doubles: Jackson Sokolowski & Sam Zhao (X) def. Max Dragon & Evan Arovas (A) 7-6 (8-6), 6-1; Jon Schachter & Gabe Sabatelli (A) def. Alex Bonaiuto & Zach Ciampi 6-2, 4-6, 6-4; Finn Dowler & Josh Aresco (X) def. Geoff Wadey & Tommy Livesay (A) 6-3, 6-1. (at Newtown): singles: Eric Raut (B) def. Sam Cannizzo 6-0, 6-2; Tyson Nichols (B) def. Stephen Dooley 6-2, 6-0; Jake Bernard (B) def. Nihan Soman 6-1, 6-2; Nick Buchan (B) def. Ben Futterman 6-3, 6-2; doubles: Adam Ortiz/Alex Klein (B) def. Luke Sposato/Rohan Mansukhani; Bobby Tremont/Jalen Johnson (B) def. Jacob Shuman/Josh Parson 6-2, 0-6, 6-1; Owen O’Reilly/John McCleary (B) def. Chris Lindsay/Sachio Mansusskhani 6-3, 6-3. (At Woodbridge): Singles: Sarah Bullers (A) def Emily Dietzko 6-0, 6-1; Sydney Pitter (A) def. Hannah Dietzko 6-3, 6-1; Adithi Wijesekera (A) def. Kiera Stankewich 6-1 6-0; Chloe Gherlone (A) def. Morgan Mancuso 6-4 6-3. Doubles: Catalina Betancur and Annika Minotti (A) def Allie Stankewich and Charlotte Zimmerman 6-2, 6-1; Eesha Acharya and Gabby McGovern (A) def. Emma Mullet and Veronica Zimmer 6-2,6-2; Summer Hechler and Chloe Shaff (G) def Rosie Du and Rhea Dey 3-6, 7-5 (10-6). Records: Amity 2-0. Guilford 1-2. (at Middletown): Singles: Lorenza Inserra (M) def Olivia Santoro (C) 6-0, 7-5; Abby Weaver (M) def Sydney Wang (C) 6-0, 6-0; Jenna DeGennaro C) def Julia Wenceslao (M) 7-6, 2-6, 6-3; Lila Cerritelli (M) def Tarana Eldridge (C) 6-3, 6-3; Doubles: Kelsey Mann & Jenny Wang (C) def Marie Emerson & Katie Dougherty (M) 6-1,6-1; Christine Anthony & Sophie Seigal (C) Jordyn Belcourt & Maggie Garcia (M) 6-4,6-4; Ellie Rockoff & Alyssa Behuniak (C) def Ava Bankoski & Maggie Garcia (M) 6-2,6-2. Records: Mercy 0-2; Cheshire 1-0. (at Milford): Singles: Singles: Skylar Korman(LH) def Emily Dietzko(GH) 6-3, 6-3; Claudia Robinson(LH) def Kiera Stankewich(GH) 6-2, 6-2; Hannah Dietzko(GH) def Kate Backus(LH) 6-2, 6-3; Chelsea Larke(LH) def Veronica Zimmer (GH) 7-5, 6-3. Doubles: Missy Caiola/Audrey Ulrich(LH) def Allie Stankewich/Charlotte Zimmer(GH) 6-4, 7-6; Lauren Dowling/Olivia Golden(LH) def Morgan Mancuso/Emma Murlet(GH) 6-1, 6-4; MaryGrace SanFilippo/Caleigh Peloso(LH) def Summer Heckler/Chloe Shoff(GH) 6-4, 6-2. (At Milford): Singles: Lucia Pino (L) def. Samantha Valardi 6-0, 6-0; Monica Pydipati (L) def. Gianna Benni 6-0, 6-0; Jenna Bagdasarian (L) def. Sara Giardi 6-0, 6-0; Bridget Sanchez (L) def. Nuala Paudyal 7-6 (9-7), 6-2. Doubles: Shae LePre/Alayna Boileau (B) def. Diya Daruka/Nihitha Kothapalli 6-2, 6-1; Sarah Berdon/Ellie Bartlett (B) def. Amelia Mower/Jenna Stash 6-2, 5-7, 6-3; Brynn Costello/Meghan Loftus (L) def. Jessica King/Juliana Torello 4-6, 6-0, 6-1. Records: Law 1-1, Branford 1-1. (at Wallingford): Singles: Jillian Barron (LH) won against Denise Marallon (C) 6-1 6-3; Savannah Farkash (LH) won against Marula Abdelati (C) 6-0 6-3; Maddie Kizer (LH) won against Danielle Marallon (C) 6-1 6-1; Kiera Farley (LH) won against Esmeralda Gutierrez (C) 6-0 6-0; Doubles: Abbey Pallas and Nicole Nicefaro (LH) won against Angelina Saunders and Diamond Humes (C) 6-0 6-0; Robyn Honyotski and Bianca Vega (LH) won against Evelyn Espinosa and Joanna Cando (C) 6-2 6-0; Keertana Chagari and Olivia Vegliante (LH) won against Veronica Borowoski and Michelle Cortes (C) 6-0 6-0. (at North Haven): Singles: 1. Julia Migliorini (NH) def. Lorenza Inserra (M), 6-0,6-0 2. Ally Vollero (NH) def Abby Weaver (M) 6-2,6-2 3. Lily Mezzi (NH) def Julia Wenceslao (M) 6-1,6-1 4. Anna Woottan (NH) def Lila Cerritelli (M) 6-4,6-4. Doubles: 1. Katie Dougherty & Marie Emerson (M) def Zoe Bowerman & Kara Stevens (NH) 6-7,6-2,10-8 2. Jordyn Belcourt & Maggie Garcia (M) def Jess Tran & Danielle Bryson (NH) 6-4,6-3 3. Emily Crusberg & Kat Antico (M) def Yasmin Mohamed & Claire Looney (NH) 7-5,6-3. Records: Mercy 0-1; North Haven 1-0. (at Milford): Singles: Julia Migliorini (NH) def. Grace Hiza 6-0, 6-0; Ally Valero (NH) def. Kyra Johnson 6-2, 7-5; Eleanor Noyes (F) def. Lily Mezzi 7-5, 6-2; Sarah Lockwood (F) def. Anna Wooton 6-3, 6-3. Doubles: Zoe Bowerman-Kara Stevens (NH) def. Izzy Connelly-Natalie Hubler 6-7 (6-8), 6-3, 6-4; Daniella Bryson- Jess Tran (NH) def. Meghan Stokes-Zoe Eichner 6-4, 6-4; Yasmin Mohamed-Claire Looney (NH) def. Olivia Connelly-Vaishnavi Bulusu 6-3, 6-1. Records: F 1-1, NH 2-0. (at Wolfe Park, Monroe): singles: Kathryn Conley (M) def. Meghan Burke 6-3, 6-2; Sophia Norton (M) def. Ella Clayton 6-1, 6-1; Margaret Kokorda (M) def. Sydney Manzo 6-1, 6-1; Chloe Hurme (M) def. Vanessa Joseph 6-1, 6-1; doubles: Michell Antony/Melanie Antony (M) def. Olivia Carriero/Christina Cheeseman 6-4, 7-5; Aarti Arasada/Molly Bonczek (M) def. Rosa Badolato/Bernae Webb 6-0, 6-0; Violet Carlson/Neha Samuel (M) def. Amayah Algarin/Catalina Jimenez 6-0, 6-0. Records: Masuk 1-0, ND-Fairfield 0-1. (at Barlow): singles: Marie Ann Tomaj (N) def. Cally Higgins 6-2, 6-3; Elizabeth McCain (B) def. Amanda Conrod 6-1, 6-2; Sofia Krzewicki (B) def. Jen Lorenz 6-1, 6-2; Amelia Hufschmied (N) def. Hannah Tunick 6-3, 7-5; doubles: Julia Klein/Julia Dolan (N) def. Claire Lamb/Laurel Winslow 3-6, 6-2, 6-4; Kaela Klein/Victoria Koltchine (B) def. Payton Bradley/Katerina Rosen 7-5, 6-4; Janelle Wargo/Katelyn Kuczmarski (B) def. Mary Celentano/Julia Clark 6-4, 6-0. Records: Barlow 2-0, Newtown 0-1. (at Wilton): singles: Alex Iotzova (W) def. Iasiah Sena 6-2, 2-6, 10-6; Rhea Raghavan (W) def. Erickah Tertulian 6-0, 6-1; Kate Seelert (W) def. Angelica Martin 6-1, 6-0; Annie Caldwell (W) def. Sam Aguilar 6-0, 6-0; doubles: Mackenzie McCormick/Campbell Johnson (W) def. Madison French/Maya Gososmann 6-1, 6-0; Julia Morano/Anusha Chegu (W) def. Jackie Ramirez/Jolie Luben 6-0, 6-0; Johanna Knox/Caroline Gruseke (W) def. Gjesika Lleshdedaj/Claudia Uva 6-0, 6-1. (at Trumbull): singles: Emma Wiley (D) def. Symphany Akinloye 6-0, 6-1; Katie Wiley (D) def. Leilani Brown 6-3, 6-0; Abby Stravato (D) def. Evani Dalal 6-1, 6-0; Cameron Cavanna (D) def. Libby Liggins 6-1, 6-2; doubles: Juliet Homes/Elaina Cummiskey (D) def. Amelia Grasso/Laine Neufeld 6-1, 6-0; Quin Wolters/Caroline Hojsgood (D) def. Bella Basic/Vishy Kandala 6-1, 6-1; Annabelle Mueller/Chase Cleary (D) def. Ritika Birje/Ally Szabo 6-3, 6-1. Records: Darien 2-0, Trumbull 1-1. (at Woodbridge): 100 Meter Dash: Okeke, Gabe, Hamden, 11.86; 200: Davis SR, Rodney, Hamden, 22.87; 400: Johnson, Paul, Amity, 52.07; 800: Swift, Damon, Hamden, 2:05.27; 1600: Mellitt, Brendan, Cheshire, 4:39.69; 3200: Mellitt, Brendan, Cheshire, 10:19.14; 110 Meter Hurdles: Papa, Richard, Amity, 15.75; 300 Meter Hurdles: Papa, Richard, Amity, 41.85; 4×100 Meter Relay Amity (Dibenedetto, Joseph 12, Johnson, Paul 12, Reed, Christopher 12, Papa, Richard 12), 44.58; 4×400 Meter Relay: Amity (Johnson, Paul 12, Reed, Christopher 12, Gilbride, Austin 11, Papa, Richard 12), 3:39.86; 4×800 Meter Relay: Cheshire (Farrell, Ryan 10, Mellitt, Brendan 11, Simpatico, Francis 11, Pettit, Charlie 11), 8:38.67; High Jump: Tonge, Cornell, Hamden, 5-10; Pole Vault: Ky, Jason, Amity, 10-06; Long Jump: Tonge, Cornell, Hamden, 19-05; Triple Jump: Koorejian, Samuel, Amity, 37-00.50; Shot Put: Cangiano, Sean, Cheshire, 41-11; Discus: Belton-Tilghman, Quinton, Amity, 122-00; Javelin: Figueroa, Edwin, Hamden, 156-09. (at Shelton): 4×800 relay: Shelton 8:48.7, 4×100 relay: Shelton 44, 110 hurdles: McGeary (Hand) 16.5, 100: Bogan (Sheehan) 11.0, javelin: Jordan (Sheehan) 164-06, long jump: Lutz (Hand) 20-07.5, 1600: Dillon (Shelton) 4:36.4, 400: Hines (Hand) 52.4, shot put: Kyle (Sheehan) 47-00.5, 800: Sacoto (Shelton) 2:06.7, high jump: Boccino (Shelton) 5-08, 300 hurdles: McGeary (Hand) 42.5, 200 Bogan (Sheehan), time n/a; triple jump: Ibekwe (Shelton) 39-01.5, discus: Isaiah (Hand) 113-10.5, pole vault Bryce (Hand) 12-0, 3200 Dillon (Shelton) 10:10.4, 4×400 relay: (Hand) 3:36.3. (at North Haven): 4x800m Wilbur Cross (Travis Martin, Musa Hussain, Noah Lee, Nassiah Betancourt) 9:01.2; 4x100m North Haven (Janni Snipes, Albert Brooks, Jack Pollard, Chris Moran) 47.2; 110mh- Keven Spencer NH 18.5; 100m -Armon Hyslop WC 11.0; Jav- Anthony Vigliotto NH 115’ 3”; Shot- Kyle Maruca NH 42’ 6”; 1600m- Martin WC 4:44.7; Discuss-Kyle Maruca NH 140’ 0”; LJ- Moran NH 18’ 8”; PV- Eric Spignesi NH 10’639”; 400m-Caleb Owen WC 51.6; HJ-Jasiah Barnes WC 5’ 2”; 200m-Devin Cue WC 23.2; TJ-Cue WC 39’ 11”; 3200m-Martin WC 10:34.3; 4 x 400m-Wilbur Cross (Nas Betancourt, Owen, Lee,Mashito Nishimura) 3:39.2; 300mh- Spencer NH 47.0. Records: WC 1-0. NH 0-1. (at Middletown): 4×800 relay: Xavier 9:00 (Luke, Lujambio, Burke, D. Selfors); 4×100 relay: Notre Dame 46.1 (Aurora, Jenkins, Tonelli, Blocker); 110 hurdles: Russo (ND) 16.0; 100: Aurora (ND) 11.1; 1600: C. Selfors (X), 4:56; 400: Sylvain (X), 50.3; 300 hurdles: Prushinski (ND), 43.7; 800: Grochowski (X), 2:08; 200: Aurora (ND), 24.0; 3200: Schulten (X), 10:16; 4×400 relay: Xavier 3:37.0 (Dickman,Grochowski, Curran, Sylvain); long jump: Jones (ND) 19-4.75; triple jump: Wiggins (X) 38-9.5; javelin: Armenia (X), 131-5; discus: Kleinrobbenhaar (ND), 98-7; shot put: Colon (X), 47-3.5; pole vault: Bothwell (ND), 11-0. Records: Xavier 1-0 (1-0), Notre Dame 0-1 (0-1). (at Warde): 4×800 relay: Danbury 8:32.50; 4×100 relay: Warde 49.30; 110 hurdles: Wiltshire (D) 16.30; 100: Thomas (D) 11.20; 1600: Pomer (W) 4:35.60; 400: Kwarteng (D) 53.60; 300 hurdles: Fahsbender (D) 45.10; 800: Muhlenberg (W) 2:08.30; 200: Thomas (D) 22.90; 3200: Going (D) 10:12.40; 4×400 relay: Danbury 3:45.70; javelin: Nam (W) 116-5; discus: Harvey (W) 97-7; shot put: Harvey (W) 39-7; long jump: DeMato (W) 19-8; triple jump: Umunakwe (D) 37-0; high jump: Carter (D) 5-8; pole vault: Green (D) 9-0. Records: Danbury 1-0, Warde 0-1. (at Cheshire): 4×800: Cheshire (Amanda Addesso, Rosie Marquez, Emily Longmore, Meghan Geogescu), 11:07.9; 4×100: Amity (Emily Zielinski, Daria Torrenti, Alez Piaza, Audrey Marin), 50.9; 100 hurdles: Riley Petit (C), 15.7; 100: Emily Zielinski (H), 5:37.2; 1600: Ella Bradford (H), 5:37.2; 400: Ehsan Ibet (H), 63.0; 300 hurdles: Arreiyona Jones (H), 51.9; 800: Kayla Byrne (C), 2:42; 200: Jalyn Roberts (H), 26.7; 3200: Ariana Garcy (A), 12:49.7; Long jump: Sam Nowak (C), 14-9; triple jump: Kate Yuan (A), 30-8; High jump: Megan Carpenter (A), 4-8; Javelin: Maddy Adzigian (A), 97-0; Shot put: Eva Green (A), 28-11; Doscus: Hannah Portal (C), 80-6; pole vault: Ameya Arun (C), 6-6. (at Milford): 4×800 Relay: Guilford 11:33; 4×100 Relay: Foran 54.3; 100 Hurdles: Tondora (F) 18.2; 100: Dennis (F) 14.8; 1600: Bloss (G) 5:32; 400: Smith (F) 68.6; 300 IH: Tondora (F) 55.7 ; High Jump Maleski (F) 4-6; 800: Ghazagh(G) 2:59; 200: Fernandez (F) 27.2; 3200: Bloss (G) 12.16; 4×4 Relay Foran 4:20; Triple Jump McClure (G) 29-6; Javelin Koff (F) 70-6; Long Jump Dennis (F)14-1, Pole Vault Meade (F) 8-0; Shot Put Taylor (F) 21-6: Discus: Fiorello (M) 58-9. Records Foran 1-0. (at Warde): 4×100 relay: Danbury 50.30; 100 hurdles: Carter (D) 18.70; 100: Smith (D) 12.90; 1600: Johnson (D) 5:37.40; 400: Smith (D) 1:00.70; 300 hurdles: Chiarello (D) 55.20; 800: Kareem (W) 2:42.00; 200: Williams (D) 27.90; 3200: Johnson (D) 12:25.40; 4×400 relay: Danbury 4:24.60; javelin: Rogers (D) 73-0; discus: Chikezie (D) 73-5; shot put: Parkinson (D) 31-3; long jump: Kry (D) 16-8.5; triple jump: Robles (D) 32-4.5; high jump: Williams (D) 4-2; pole vault: Knorr (W) 7-0. Records: Danbury 1-0, Warde 0-1. (at Race Brook CC): Medalists: Jake Ivan-Pal (ND) and Kyle St. Pierre (S) 36. ND: Tommy Rosati 39, Jon Bushka 40, Joe D’Agostino 44. S: Tim Hafale 38, Ryan Martorella 39, Vin DeFeo 47. Records: ND 1-0; S 0-1. (at Portland GC, par 35): Medalist: Jack Walsh (OS), 40. Old Saybrook: Ben O’Dell, 42, Matt Rothman, 47, Garrett Brady, 44, Garrett Hilger, 64. Portland: Bryce Cote, 42, Ben Kelley, 43, Brian Fickett, 52, Tim Donoghue, 42, Steven Fickett, 45. (at Portland Golf Club): Medalist: Chris Fosdick (X) 35; Xavier: Kevin Lynch 38, Patrick Kennedy 40, Chris Drisdelle 44, Ryan Holgerson 46; Amity: Dan Comeau 50, Brett Chados 50, Marcello Colonna 50, Kenny Page 53, Cody White 55. Records: Xavier 1-0; Amity 0-1. (at Whitney Farms GC, par 36): N—David Brestovansky 43, Tim Davis 44, Trevor Hislop 46, Jimmy Davies 50; M—Nick Sentementes 44, Colin Abbott 47, Christian Chung 48, Henry Minnick 50. (at Redding CC, par 36): B—Arnold Wright 43, James Menapace 48, Mitch Worthington 48, Luke Dube 52; B—Brian Green 58, Mike Giangregio 73, Vincenzo Jimenez 100. Records: Barlow 2-0, ND-Fairfield 0-1. (at Mill River CC): NDF—Kate Pond 45, Alexa Volpacchio 67, Elizabeth Lafrance 68, Rose Baker 77; S—Chloe Pappas 78, Stacy Medina 84, Natalie Melo 84, Ruhuan Liao 85. (at Richter Park GC, par 35): I—Mackenzie Garden 57, Lauren Oskam 58, Shea Foye 58, Sadie Mellen 59; B—Anne Gregory 62, Sarah Polcari 66, Katie Fletcher 70, Eva Feningdorf 74. Records: Immaculate 1-0, Barlow 0-1.